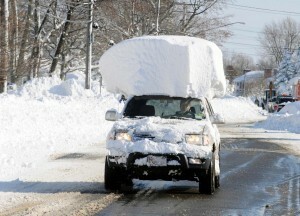 This fierce onset of winter caught many people across the country by surprise. After all, it’s not even Thanksgiving. Although temperatures will be moderating over the weekend for much of the US – bringing the risk of flooding to many affected by this week’s snowstorm in the northeast and a welcome and benign warm-up to many others – the annual rollercoaster of winter weather is just beginning. If you’ve ever wondered why winter weather fluctuates so dramatically, you’re not alone. And you can place much of the blame on the location of the polar jet stream. Yeah, we know – it’s easier to blame the meteorologist messenger. But hear the messenger out on this one. Jet streams are like fast-moving rivers of air in the upper troposphere, at approximately the same altitudes that commercial aircraft cruise. And just as rivers of water flow faster when the elevation change is dramatic and steep, jet streams become more vigorous during the winter, when the temperature difference (“gradient”) between the poles and the equator is more dramatic (it’s beach weather year round in Key West, but come January in Maine, you’re going to want to be wearing more than just a swimsuit). As winter progresses, the pool of cold air at the poles expands and sinks southward. Since jet streams are found where the temperature gradient is largest – at the boundary between cold and warm air – the polar jet slides southward along with the expanding pool of cold air. 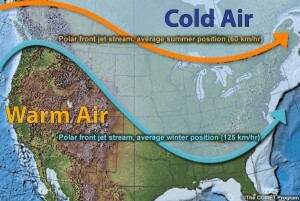 Although in summer, the polar jet is typically pinned near the US-Canada border, in winter it can plunge as far south as Florida. The polar jet isn’t straight, either, but rather meanders from north to south, bringing that characteristic wintertime rollercoaster of relatively warm and sunny weather (under ridges) followed by cold, dreary, and occasionally downright miserable weather (in troughs). 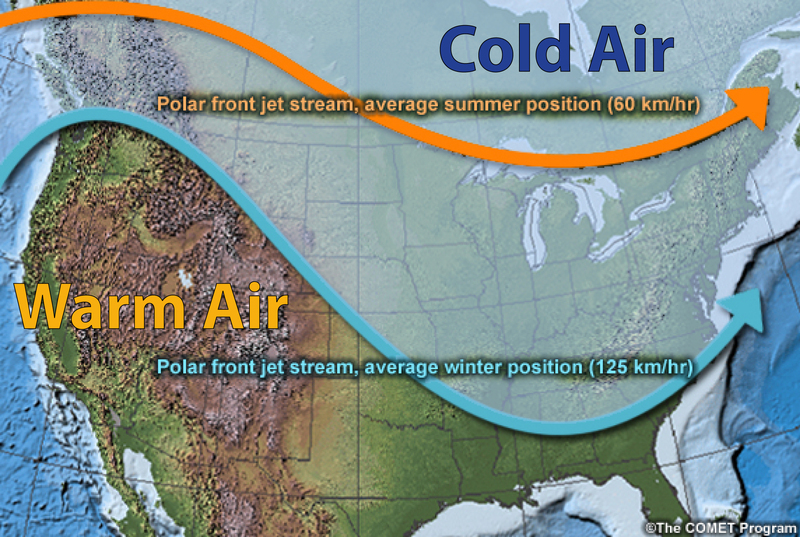 Where the jet stream ends up draping itself and how strong it is determines much about the winter’s weather. Certain large-scale factors (like the presence of an El Niño or La Niña), can exert a powerful influence on the average position of the jet stream and therefore on seasonal temperatures and precipitation. What Will This Winter’s Weather Bring? Despite indications this summer of a developing strong El Niño, it hasn’t materialized. Forecasters at the Climate Prediction Center are now calling for about a 60% chance of a weak El Niño developing this winter. This lack of a strong climate driver, like El Niño, makes seasonal forecasts somewhat less certain. Although seasonal forecasts will never be able to predict daily high temperatures or the probability of afternoon precipitation months in advance, they can offer insight into general patterns and trends, like whether this winter is likely to be warmer or cooler than average. The strength of those patterns and trends, and therefore the skill of the seasonal forecast, is highest when strong, large-scale climate drivers dominate. So, what about this winter’s weather? NOAA forecasters at the Climate Prediction Center are anticipating cooler than average temperatures across much of the Southeast and Southern Plains, with above average temperatures favored in the western US and throughout Alaska. 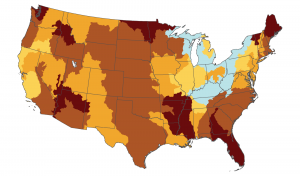 Wetter than normal conditions are more likely throughout the southern US and along much of the East Coast, while drier than normal conditions are favored in the Northwest and Upper Midwest. Precipitation forecast for December, January, and February from the Climate Prediction Center. Given the fairly weak El Niño signal this year, forecast confidence isn’t particularly high, but for those folks in the northeast still reeling from this week’s snowstorm, take heart. That winter pummeling isn’t likely to be the season’s norm. But for those of us in Florida, it might be worth picking up another couple of ugly holiday sweaters from the sale racks… you know, for layering. Fresh water is among the earth’s most precious resources – we drink it, cook with it, bathe in it, farm with it, and use it in the generation of much of the world’s electricity. It is fundamental not only to life, but to our way of life. Yet water availability is not assured for billions of people across the planet, and research has indicated that in the near future, an even larger percentage of people will likely face water scarcity. The reasons behind the projected increase in water scarcity can be boiled down to supply and demand. 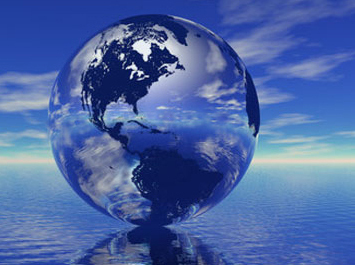 The supply of fresh water comes from precipitation and is stored in lakes, rivers, aquifers, and snowpack. Weather obviously affects the water supply from season to season and from year to year, but over the long term, climate is the main driver. When the climate is in a relatively steady state (as it was for about the past 12,000 years as humanity developed agriculture, civilization, and technology), so too is water availability. Sure, droughts and very wet periods occur, but over decades and centuries, it tends to even out. However, when the climate is rapidly changing (as it is now), water availability becomes less certain. Precipitation patterns shift and so too do the locations and levels of lakes and rivers, aquifers and snowpacks. The sources we have depended on for water become undependable. That’s what we’re facing now. The supply of fresh water is shifting – increasing in some places and decreasing in others. Unfortunately for us, many of the regions that are expected to see a decrease in total water availability are also heavily populated. 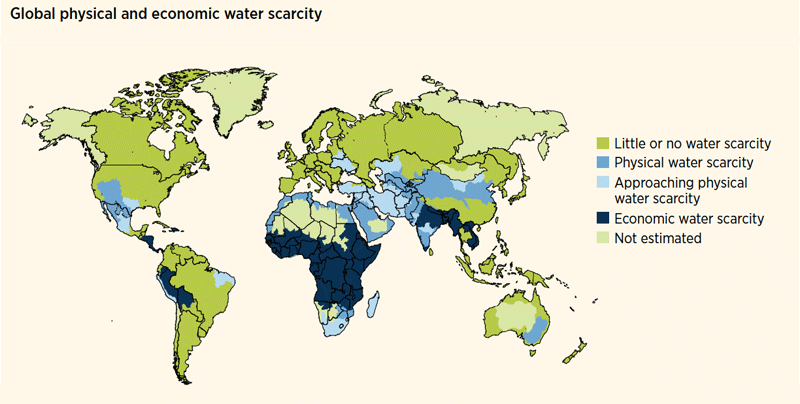 And here is where supply predictably meets demand: people use water. 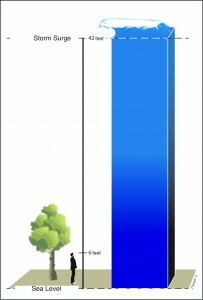 Primarily, we use it to grow food and to produce electricity. In the US, these two uses account for over 75% of total water withdrawals. As the global population grows and becomes more industrialized, we have more mouths to feed and more high-tech lifestyles to power. If we continue with business as usual, we could face a direct conflict between agriculture, electricity generation, and other water uses by 2040. We could literally use up all of the available water in the system. Judicious and mindful use of water (i.e. not being blatantly wasteful) and adoption of more water-efficient farming practices can go a long way towards conserving water resources (demand side), while the energy sector offers opportunities for a “twofer” — both reducing water use (demand) as well as mitigating climatic changes that threaten to disrupt water availability (supply). All thermoelectric power systems (like the combustion of coal or natural gas to produce steam that drives turbine generators) require inputs of water, both to create the steam and often to cool it. Meanwhile, if the power plant relies on a hydrocarbon fuel, it’s also emitting carbon dioxide and other greenhouse gases. Solar and wind power are familiar and growing alternatives to traditional thermoelectric electricity generation methods, and they offer the twin benefits of significantly reduced water use and dramatically reduced greenhouse gas emissions. For people living in developed regions that can provide the supporting infrastructure and dependable maintenance that solar and wind systems typically require, these alternative energy solutions are very promising. But for people living in less developed or simply less accessible regions, portable gasoline- or propane-powered generators are often their only option — although perhaps not for much longer. Andrew Kazantsev and his team of Russian scientists have reportedly developed a device that collects atmospheric moisture and channels it down to the ground where it can be used for both drinking water and electricity generation. 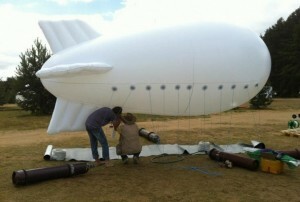 The device, called Air HES looks like a small dirigible (aerostat) with a fine mesh hanging below it. The aerostat rises to the mid-levels of the atmosphere, where water vapor and water droplets in clouds condense onto the mesh and are funneled to the ground. The water pressure from the descending stream of droplets can then be used to power a generator and create electricity. Kazantsev reported that the prototype Air HES was able to create approximately 5 liters of fresh water per hour from low level clouds. If the technology scales successfully, it could provide not only portable clean electricity generation but also potable water to inaccessible and/or undeveloped regions where both are sorely needed. Technology and the need for electrical power have inarguably propelled us into this water scarcity and climate change challenge, but with ingenuity and willpower, technology may well help us out of it as well. Typically, forensic meteorology is applied to weather events a few years old at most – Did damaging hail really strike that commercial facility in April of last year? Was it a tornado or a microburst that ripped off roofs and uprooted trees last week? Did a lightning strike start that house fire a few months back? Occasionally, though, forensic meteorologists look decades or even centuries into the past. Such has been the case with Tropical Cyclone (TC) Mahina, which struck Bathurst Bay, Australia, on 5 March 1899 as a Category 5 storm. Since the publication of a research paper by H.E. 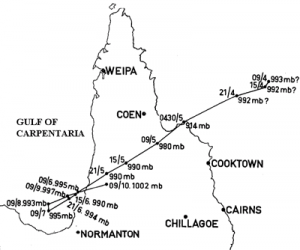 Whittingham in 1958 titled “The Bathurst Bay Hurricane and associated storm surge” reported that TC Mahina produced a storm surge of 13 meters (or over 42 feet), that storm has generally been credited with the largest ever-recorded storm surge. Contemporary accounts of the storm reported a waist-deep wall of water inundating a 40 ft tall ridge where several law enforcement officers were camped during the storm, dolphins being found stranded atop 15 m high cliffs after the storm had passed, and fragments of Aboriginal canoes being deposited 70 to 80 feet above the normal high tide. TC Mahina was a undoubtedly a monster storm. With sustained winds of over 175 mph, it sank 54 ships (mostly pearling vessels) and killed more than 300 people, sweeping devastation across the Bathurst Bay region of northeastern Australia. Yet despite its impressive statistics and a number of contemporary (albeit generally third-person) accounts of storm-related inundation, meteorologists have long regarded the 13 m storm surge record skeptically. It just didn’t seem possible. The commonly reported central pressure of 27 inches of mercury (914 mb), while extremely low, just doesn’t support a storm surge as high as a four-story building. Previous studies that used computer models to estimate storm surge given the most likely track and intensity of the cyclone over this topographically complex region had come up well short of 13 m, and field work in the region had not found evidence of debris deposits to the reported 13 m height. Something was amiss – either the central pressure was lower than 27 inHg or the storm surge wasn’t actually 13 m high. Possibly both. Despite the contradictory evidence, little research had been done to set the record straight, until recently. 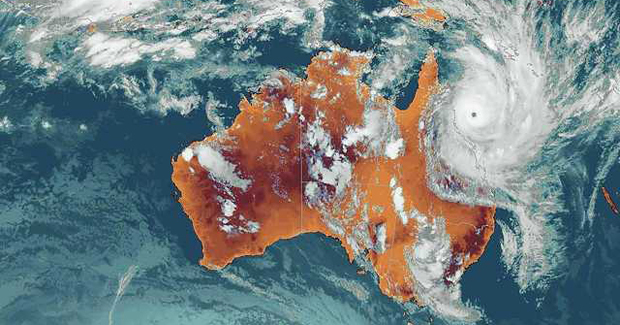 In the May 2014 issue of the Bulletin of the American Meteorological Society (BAMS), several Australian scientists revealed the results of their forensic analysis of TC Mahina’s storm surge. In that analysis, they utilized methods that forensic meteorologists often use to evaluate much more recent weather events: they investigated historical records, examined the physical evidence, and modeled the event. What they learned is that, as is often the case, the devil is in the details. Previous modeling studies had relied upon a thirdhand account of Mahina’s central pressure published in an anonymously authored report several months after the cyclone made landfall. That central pressure – 27 inches of mercury (or 917 mb) – was simply too high to produce a 42 foot storm surge. 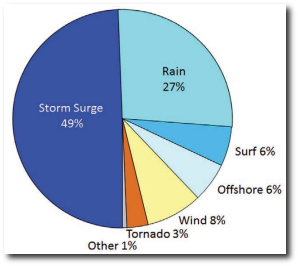 Factors that influence storm surge size. Image credit: COMET Program. So it would seem that the central pressure that had been used in previous modeling studies – studies that had failed to reproduce anything nearing a 13 m storm surge – had been too high. Perhaps the lower pressure of 26 inHg would create the reported record storm surge? Before jumping straight into the modeling, though, the authors also re-examined the physical evidence – debris that was washed up and deposited by the storm. They found wave-deposited sandy sediments 6.6 meters above mean sea level at Ninian Bay, the location where law enforcement officers reported the 13 m storm surge, but they found no evidence of inundation above that. The difference between astronomical tide, storm surge, and storm tide. Image credit: NOAA. This doesn’t necessarily rule out the 13 m water level, however. During tropical cyclones, the highest debris tends to consist of biological material that floats, like leaves, sea grasses, and small marine animals. This material also tends to biodegrade after a few years or decades, leaving no trace for forensic meteorologists peering 115 years into the past. Observations after more recent tropical cyclones suggest that sandy sediments can be deposited at only half the height of maximum inundation, so it is quite possible that the water did reach a height of 13 m above mean sea level at Ninian Bay, where those sandy deposits were found at 6.6 m.
Once the authors had concluded that there was a decent probability that the storm’s central pressure really was 26 inHg and that the waves at Ninian Bay really did reach 13 m above mean sea level, they set about to model the storm surge based on a range of storm forward speeds and storm tracks suggested by ships’ wind and pressure recordings as well as damage assessments after the storm passed. What they discovered was that even in a worst-case scenario (Mahina approached Bathurst Bay from the northeast with a central pressure of 26 inHg), the storm surge would “only” be about 9 m.
And here is where the devil is in the details. You see, there’s a difference between storm surge and maximum inundation. 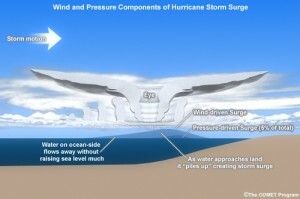 Storm surge is the abnormal rise of water generated by a tropical cyclone, over and above the natural (astronomical) tides. Click here for an animation of storm surge in an area of steep topography, similar to Bathurst Bay. 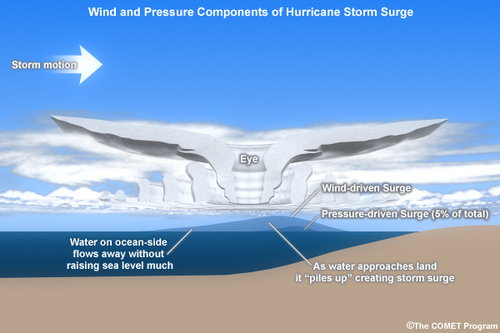 Storm surge is influenced by the size of the storm, winds speed within the storm, the forward speed of the storm as it approaches land, the angle of approach to the coast, the topography of the sea floor and coast, and the storm’s central pressure. Maximum inundation, on the other hand, is just what it sounds like – the maximum height that water reaches above mean sea level. Maximum inundation is influenced by the height of the storm surge, the timing of astronomical tides, and various types of wave action like wave setup and wave run-up. It’s the high water mark. And the high water mark is almost always higher than the storm surge. In fact, in severe tropical cyclones in northeastern Australia, wave and tidal effects have added approximately 25% to the height of maximum inundation. The contribution of wave setup, wave run-up, and storm surge on the maximum inundation level. 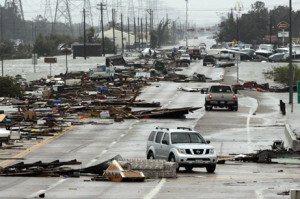 Image credit: FEMA. 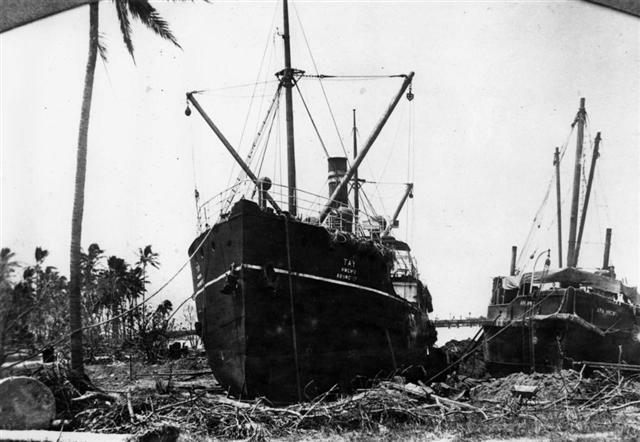 What this means for Tropical Cyclone Mahina is that the 1899 accounts of a monster cyclone that brought the sea to the top of a 40 ft high cliff may in fact have been accurate. If the central pressure was actually 26 inHg and the storm approached from the northeast, it could have generated a storm surge of up to 9 meters (30 feet). Mahina struck during astronomical high tide, and that combined with wave setup and run-up could have added an additional 4 m (12 feet) of water on top of the storm surge. So, the record for highest storm surge may have to be revised downward (Mahina’s storm surge was probably 9 meters or less), but its maximum inundation may still take the gold. It is entirely possible that on March 5th, 1899, men waded through seawater atop a 40 ft high cliff and dolphins swam through the tops of 50 ft tall trees. Blue Skies Meteorological Services offers forensic meteorological analyses of a wide range of weather events — from hail storms to lightning strikes, from flooding to tornadoes, from fog to sun glare. We typically don’t look 115 years into the past, but we’re always up for unique and interesting challenges! Give us a call or send us an email to discuss your weather-impacted legal case, insurance claim, or investigation. 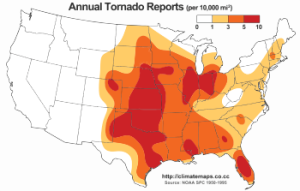 Having grown up in Oklahoma, in the heart of Tornado Alley where annual violent twisters are just part of the springtime scenery, even I was initially a bit surprised when I heard of a new report out of the Southeast Regional Climate Center (SRCC) at the University of North Carolina. According to research by Charles Konrad II and his team at the University of North Carolina (UNC), the state in which tornadoes kill the most people per mile tracked on the ground is not Oklahoma or Kansas, not Texas or Arkansas or Mississippi – it’s Florida. Now, Florida is no stranger to tornados. In fact, per square mile, Florida has more tornados than any other state in the country. But they’re usually not violent tornadoes – not like the EF5 monsters that ripped through Joplin, MO, in 2011 and through Moore, OK, in 1999 and 2013. 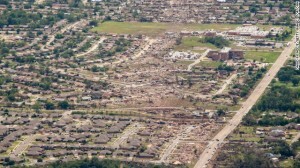 Moore, OK EF5 tornado damage, 2011. CNN. The vast majority of violent tornadoes are spawned by long-lived supercell thunderstorms, and weather patterns in Florida just don’t support those sorts of storms. 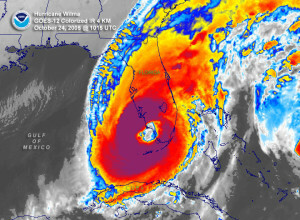 Instead, Florida typically experiences weaker tornadoes, often spun up by interactions with the Gulf Coast and Atlantic sea breezes or by tropical cyclones. These tornadoes can cause substantial damage (e.g. roofs and siding removed, trees uprooted, cars flipped), but it’s not the sort of damage that one usually thinks of as causing widespread loss of life. 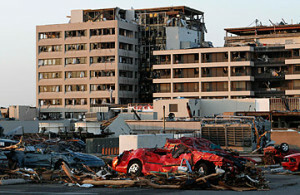 Joplin, MO, EF5 tornado damage to hospital. Time. And therein lies the initial – but not necessarily warranted – surprise. When we think about risk, we tend to oversimplify the equation. We tend to assume that exposure = risk. We figure that the bigger, badder, and more frequent the hazard, the more people are likely to be harmed by it. By that reasoning, the southern Plains and the Deep South should have the deadliest tornadoes. Those are, after all, the regions of the country that experience the highest frequency of strong tornadoes. In other words, that’s where the greatest exposure per square mile is. 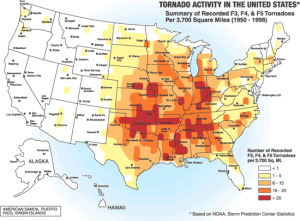 Climatology for all tornadoes (EF0 – EF5). Notice the relatively high number of total tornadoes that impact the central Florida peninsula. Climatology of strong to violent (EF3 – EF5) tornadoes. Notice that although Florida receives a relatively high number of total tornadoes, it receives relatively few strong to violent tornadoes. But that’s not where the highest density of tornado-related deaths occur. According to Konrad and his team, that dubious honor – greatest number of deaths per mile along the track of a tornado – goes to Florida. To understand why, we have to look at the real risk equation. Exposure per square mile is only part of the story. Sure, you have to have tornadoes on the ground for people to be killed by them – but you also have to have people in the path of the tornado who lack the appropriate resources to protect themselves. To understand why Florida’s risk for tornado deaths is so high, we can compare it another state with almost exactly the same average number of tornadoes per square mile: Kansas. According to the SRCC study, the number of deaths per mile along tornado tracks is nearly five times higher in Florida than in Kansas. Yet, while Florida and Kansas experience almost the same number of total tornadoes per square mile, tornadoes in Kansas are, on average, stronger than in Florida. Average annual number of total tornadoes per state per 10,000 square miles. Notice that Florida and Kansas experience roughly the same number of total tornadoes per square mile. Average annual number of strong to violent (EF3 – EF5) tornadoes per state per 10,000 square miles. Notice that Kansas experiences on average 4x more strong tornadoes per square mile than Florida. So, why isn’t Kansas at the top of the list? The answer has to do with population density and population vulnerability. The number of people in the path of the tornado is maximized when tornadoes form and track over populated areas. In Florida, tornadoes tend to cluster along the populous Atlantic coast and along a stretch of Intersate-4 from Tampa to Orlando. The population density in these regions ranges from about 300 – 1000+ people per square mile. 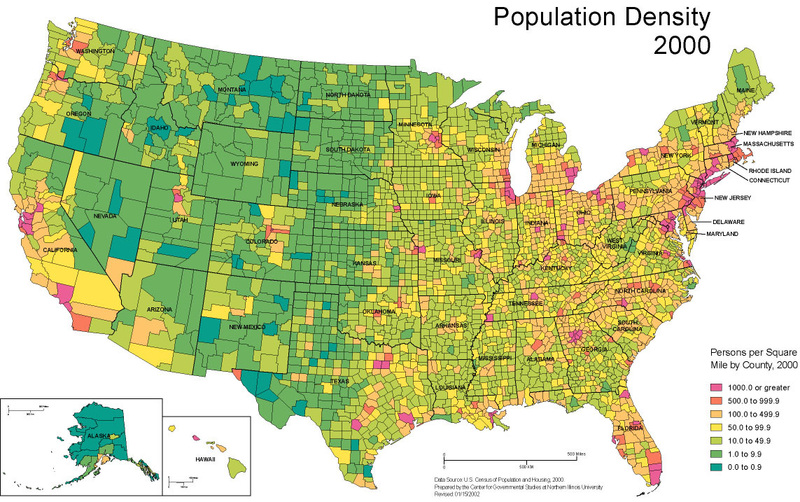 By contrast, only one county in Kansas has a population density above 1000 people per square mile, and the vast majority of the state has a population density below 50 people per square mile. In fact, the average population density of Florida is more than ten times greater than that of Kansas. 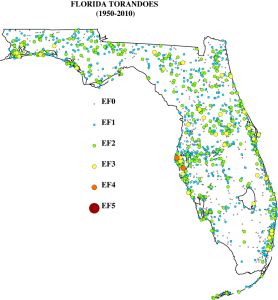 Where tornadoes are most likely to occur in Florida, by type/strength. FSU. US population density in 2000. So, when a tornado touches down in Florida, it’s much more likely to encounter people along its path. There are also a number of demographic factors that make Floridians more vulnerable to tornados than Kansans. Florida lives up to its reputation as a retiree paradise. Florida ranks first in the country in the percentage of its population over the age of 60. Kansas ranks 17th. Older people, especially those in poor health, tend to be injured more easily and more severely than younger, healthier individuals. Poverty rates in the US. The geographically adjusted poverty rate is also 8% higher in Florida than in Kansas (due, largely, to the higher cost of living in Florida) . People living in poverty often live in housing that is less sturdy and offers less tornado protection than their middle-class counterparts. And finally, the climatology of Florida (and of the Southeast in general) results in a higher percentage of Florida tornadoes occurring at night, when tornadoes are harder to see and when people are less likely to receive warnings in time to take protective action. This study out of UNC reminds us that risk assessment often has more to do with human systems and the built environment than with the natural hazards themselves. Risk exists in that intersection of exposure and vulnerability – exposure is largely a matter of where we live, while vulnerability is largely a matter of how we live. Effective risk mitigation requires understanding and addressing both. Blue Skies Meteorological Services can help businesses identify their exposure and vulnerability to weather and climate impacts so that risks can be effectively targeted and reduced while resiliency is simultaneously built into operations. 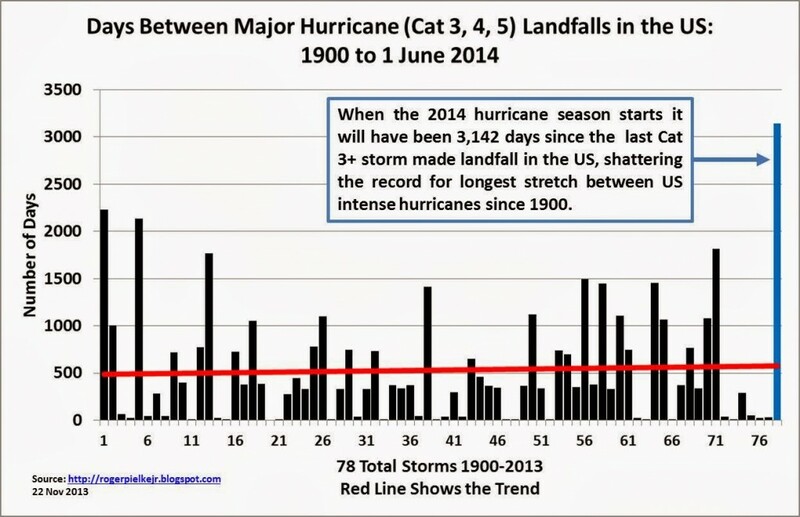 Are We Really “Due” for a Major Hurricane Landfall This Year? Hurricane Wilma, the last major hurricane to make landfall in the US. 3150 days, give or take a few. That’s how long it’s been since a major hurricane, defined as a Category 3 or higher storm, has made landfall in the U.S. The previous record was about 2250 days, almost 2.5 years shorter. 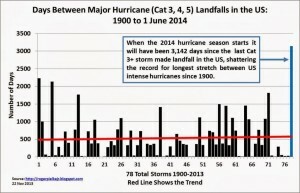 Although the time between major hurricane landfalls has varied significantly since 1900, it’s been about 500 days (or every 1-2 years) on average. So, are we really due? It’s hard not to think so. After all, if we flip a coin 8 times (for the last 8 years in which the US escaped a strike by a major hurricane) and all 8 come up heads, we start thinking, “It’s bound to come up tails next time.” But we’d be wrong (well, unless the coin was rigged). Statistics just don’t work that way. Each coin flip has the exact same 50/50 probability of heads/tails, regardless of the pattern of results that came before. So the fact that we did not suffer a major hurricane landfall last year or the year before does not in any way influence the probability of a landfall this year. Number of hurricanes per year 1950-2000. Notice that the majority of El Nino (red) years have below-average hurricane activity, while the majority of La Nina years (blue) have above average hurricane activity. Credit NOAA. What does influence the probability of a landfall is the number of storms that form and the atmospheric steering flow that guides those storms toward or away from the US coastline. This year, an El Niño pattern is expected to form during the summer or early fall, bringing warmer waters to the eastern equatorial Pacific Ocean, and, among other things, stronger vertical wind shear, stronger trade winds, and greater atmospheric stability to the Carribean and tropical Atlantic Ocean. Strong vertical wind shear inhibits tropical cyclone development, as it tends to rip nascent storms apart before they have the opportunity to organize and develop, and enhanced atmospheric stability does just what it sounds like – stabilizes the atmosphere and hinders storm formation. For these reasons, moderate to strong El Niño years are often associated with below-average hurricane activity in the Atlantic basin. 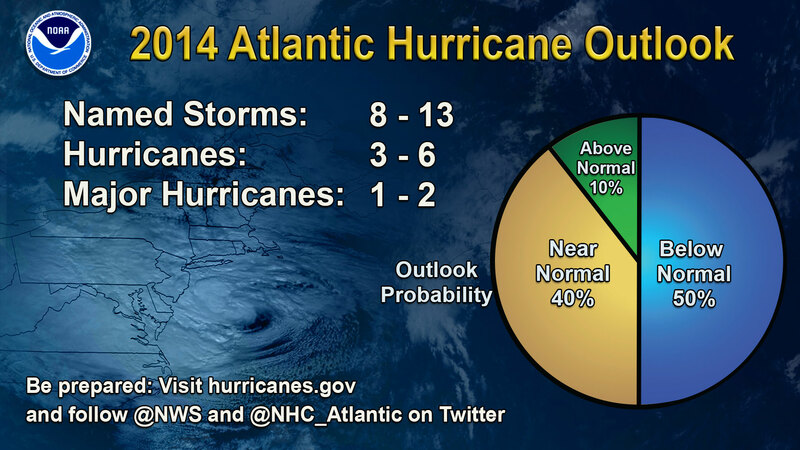 NOAA’s forecast for the 2014 hurricane season. In addition to the predicted development of El Niño later this year, Atlantic sea surface temperatures (SSTs) in the main tropical cyclone development region are expected to remain slightly below average throughout the June 1 – November 30 hurricane season. Tropical storm systems draw their energy from the warm waters over which they develop – cooler water means less energy and, generally, fewer and less intense storms. These two major factors – the expected development of El Niño and cooler sea surface temperatures in the tropical Atlantic – have led most hurricane forecasters, including NOAA, to predict an average to below-average hurricane season for 2014. Damage from Hurricane Ike near Galveston, TX. Credit National Geographic. Given the lack of a major hurricane landfall in the US during the last 8 years and the below average 2014 Atlantic hurricane season forecast, the most dangerous part of this year’s hurricane season may be complacency. We would do well to remember that it only takes one storm to create devastation (like Hurricane Andrew in 1992 that struck during an otherwise quiet season) and that even non-major hurricanes can bring widespread destruction (Hurricane Ike in 2008 and Sandy in 2012 come immediately to mind). Both Ike and Sandy go to show that the sustained wind speed of a tropical cyclone (and therefore its Saffir-Simpson category) does not solely determine its destructive potential. The physical size of the storm is also a critical determinant of its storm surge, and water kills far more people and destroys far more property than wind. Cause of tropical cyclone deaths in the United States. Credit Rappaport, 2014. The danger that storm surge poses to life and property is often poorly understood outside of the meteorological community (despite the well-publicized tragedy and horror brought by Hurricane Katrina’s storm surge in 2005). 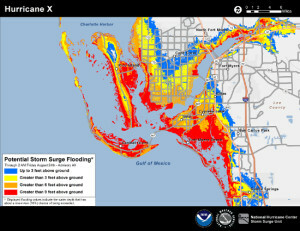 To address this common knowledge gap, the National Weather Service will begin issuing experimental Potential Storm Surge Flooding Maps for the U.S. East Coast and Gulf Coast during the 2014 hurricane season. For each hurricane that is forecast to make landfall, the storm surge maps will show the geographical areas where storm surge could occur as well as how high above ground level the water could reach in those areas. The maps are intended to provide a reasonable estimate of the worst case scenario for flooding in those areas that could be impacted by an approaching storm. 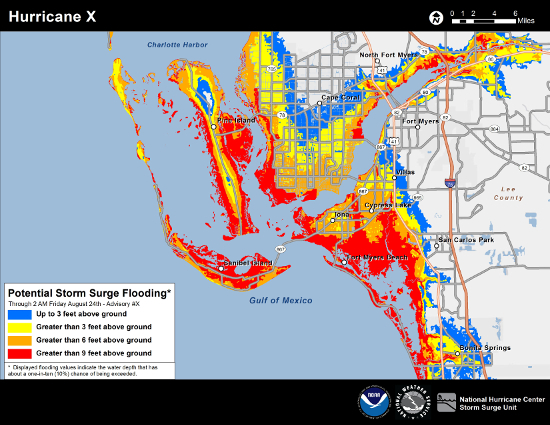 Example Potential Storm Surge Flooding Map for Ft. Myers, FL. Credit NOAA. Last week’s National Hurricane Preparedness Week, highlighted the many dangers associated with tropical cyclones, including storm surge, inland flooding, and wind. These hazards, especially inland flooding, wind, and severe thunderstorms, can affect locations hundreds of miles from the coast, so hurricane preparedness isn’t just for those folks lucky enough to live where most of us only vacation. Chances are, even if you don’t live near the coast, you have friends or family who do. Both the National Hurricane Center and Ready.gov offer excellent resources related to understanding and preparing for tropical cyclones. Many coastal states, including Florida, Louisiana, and Virginia, offer sales tax holidays when you purchase hurricane preparedness supplies at the start of the hurricane season. For those of you in Florida, like us here at Blue Skies, that sales tax holiday runs through this upcoming Sunday, June 8. We’re hoping for a season as quiet as the forecast, but even so, we’re gathering our storm supplies and reviewing our plan. We hope you’re doing the same!